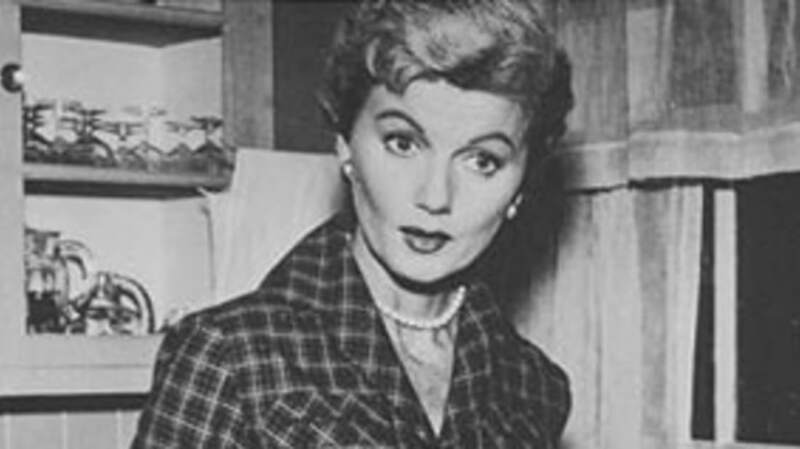 She had dozens of parts on various TV shows prior to landing her signature role, but most of the world will always remember Barbara Billingsley as June Cleaver. On Leave It to Beaver, Billingsley’s portrayal of the ultimate, extreme, ideal mom was a source of comfort to millions of kids whose home life was a far cry from the Cleavers, and the bane of millions of “regular” mothers (like my own mom, who often grumbled nasty names at the immaculately groomed Mrs. Cleaver) who never scrubbed a toilet or mopped a floor while wearing high heels. Please join us in celebrating the life and career of Everyone’s Favorite Mom. Born Barbara Combes, she married Glenn Billingsley in 1941 and had two children with him. Glenn had a cousin, Pearl, who had a son named Peter. Peter Billingsley is now a successful film producer, but he’ll probably always be remembered as the bespectacled Ralphie, who yearned for an Official Red Ryder Carbine-Action Two-Hundred-Shot Range Model Air Rifle in A Christmas Story. Her husband’s uncle was Sherman Billingsley, the founder of New York’s fashionable Stork Club. The producers of Airplane! specifically sought out Barbara Billingsley for the role of the jive-speaking senior citizen due to her “June Cleaver” persona. They knew that 80% or more of the audience would remember Mrs. Cleaver and be doubly amused at prospect of such a staid, straight-laced mother figure communicating easily with the Jive Dudes. Interestingly enough, Barbara actually did some research for that role. She had lunch with the two actors who portrayed the Jive Dudes in order to perfect her delivery, and she also did some reading in her spare time of the history of “jive” talk. She explained very sincerely years later in a TV interview that there were two schools of thought: some believed that jive language had its roots in slavery, as a method of communication “that ‘Whitey’ wouldn’t understand,” while others thought it evolved from street lingo. In any case, it’s amusing to both hear Mrs. Cleaver speak jive and to also think of her including the “Whitey” phrase so off-handedly while recalling her research. When it comes to “nice” in describing people, we could probably use the memories of Barbara Billingsley’s co-workers as a dictionary entry. Please take a moment to share your favorite June Cleaver or Jive Lady memory, since Barbara often mentioned that her proudest achievement was the knowledge that she had somehow touched someone’s life with one of her performances.